The VCAST Music app from Verizon received a substantial update this morning that delivers full-track songs, ringtones and ringback tones together through one application. You can now purchase full-length DRM-free tracks ranging from 69 cents all the way up to $1.29 and charge them directly to your bill. I gave the app a quick 5-minute walk-through and don’t have anything awful to say about it. 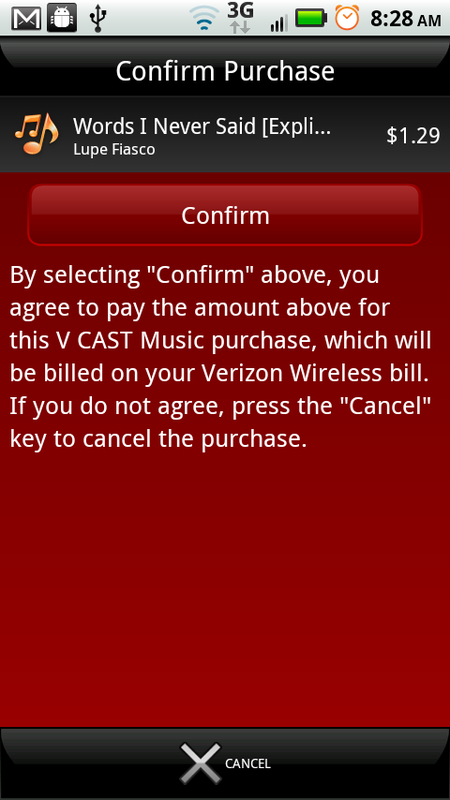 Many of you aren’t fans of VCAST apps, but you can’t completely hate on another outlet for DRM-free music purchases that can be stuck right on your VZW bill. 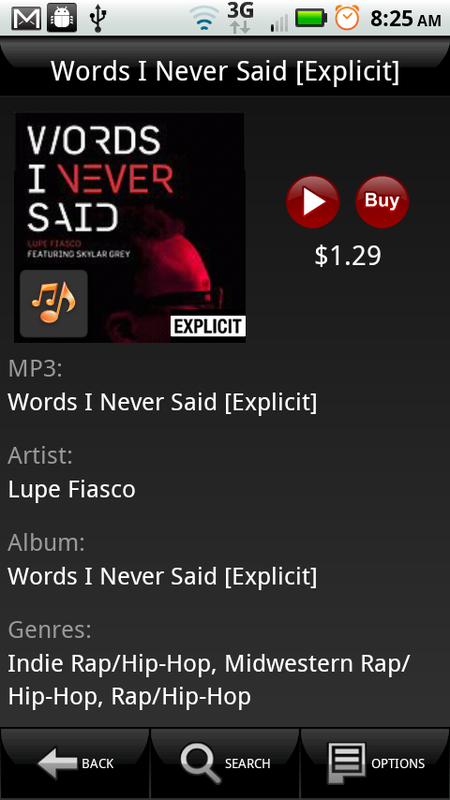 And I even found fairly new tracks like the newest from Lupe Fiasco you are seeing above and Dre’s “I Need a Dr.” Worth a look in my opinion. BASKING RIDGE, N.J. – Verizon Wireless said today the company has updated its V CAST Music app, enabling Android™ smartphone customers to get and enjoy the music they want easily and at lower prices. For the first time, V CAST Music brings full-track songs, ringtones and ringback tones together in one easy-to-use application. The new version of V CAST Music, available on Android smartphones running Android 2.1 or higher, lets customers purchase full-track songs in high-quality MP3 format without DRM. V CAST Music will now also offer full-track songs for 69 cents, 99 cents or $1.29 per song, which can be downloaded over the air to a smartphone, and then easily moved to a computer or other MP3-compatible device using V CAST Media Manager. For more information on V CAST Music, visit www.verizonwireless.com/music. For more information about Verizon Wireless products and services, call 1-800-2 JOIN IN or go towww.verizonwireless.com.